I’m reading reviews of Hello (which are pretty much universally dismissive) and it occurs to me that it sounds like Bollywood has made a call-center film which indulges in what I was afraid this one might: namely, cultural cliches and glib stereotypes. Fortunately, this film avoids that. Although told from a definite American point of view, it is very equal-handed on the outsourcing issue, and, most importantly, affectionate and accurate in presenting the Indian characters and culture. It’s a sweet, funny film and everyone should see it. It also made me homesick for India, if that’s possible when you are a gori mem from the U.S. 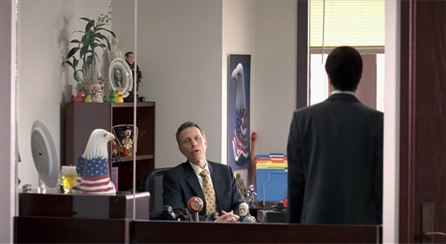 When Todd’s boss Dave (Matt Smith) calls him into his office and tells him that the department is being sent offshore, Todd is taken aback. He’s incredulous when Dave tells him that he’s the one who gets to train his replacement in India, but finally agrees. Cut to the Bombay International airport and I laugh. Puro gives him a business card and ushers him into a car for the drive to his hotel. He tells Todd that he is taking him to “Auntyji’s”—a guest house which is “much less lonely” than the grand-sounding hotel Todd has reservations at. Todd’s protests are ignored, and he is greeted happily by matronly Auntyji with tea and questions. Auntyji quizzes him in the Indian manner: “What is your salary? Are you married?” and I’m loving it. I’ve had all the same experiences that Todd is, and he’s got that shell-shocked expression on his face that I’m sure I have also had. The next morning Puro drives them to the office. Todd is horrified by what he sees. 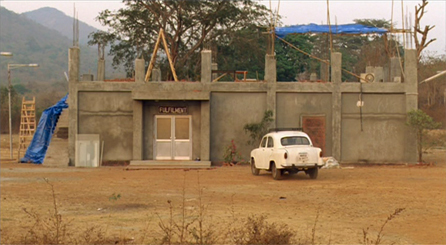 Puro explains that because of outsourcing, there is no real estate to be had in Gharapuri so they are building a new office. Inside are a bunch of people talking on phones…and a cow. Puro assures him that everything is “state-of-the-art”: the computers, the digital phone lines, everything. 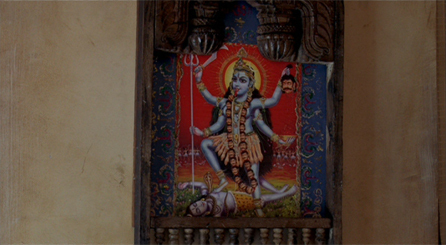 Todd is struck by a sudden pain in his guts and rushes back to his room at Auntyji’s, where a grim poster of Kali watches over his suffering. Once he’s recovered, training of his new call-center employees begins. Todd has been instructed to bring the MPI (minutes per incident) down to 6.0; it currently stands at 12:17. Battling homesickness, struggling to get accustomed to seemingly bizarre Indian ways, getting his cell phone stolen and working at nights to accommodate American time zones, Todd gamely forges on but is increasingly miserable. 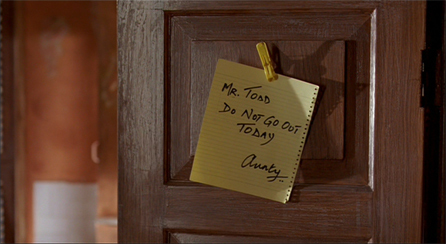 One day as he leaves for the office, he fails to see a note pinned to his door. It’s Holi! He runs into Puro, who tries to save him and his sparkling clean starched white shirt from the colors but fails miserably. Initially freaked out, Todd soon enters into the spirit of the day. 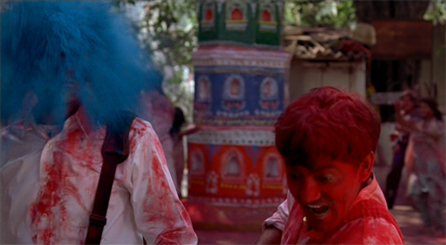 Some day…some day…I will play Holi with friends in India. Anyway, Puro and Todd indulge in the festivities, and Todd ends the day by taking a dip in the local river (or reservoir). As he looks around, the enchantment dawning on his face is clear. He’s falling for India: she’s got him in her sights! As he finally begins to acclimate, Todd changes the way he’s doing things at the call-center. He stops trying to push western ways onto the employees and relaxes the rules: murtis can sit on desks, they can wear Indian clothing instead of western, bring photos of their families to decorate their spaces with. He discovers to his surprise that many of the employees actually like the junk that they’re selling, and institutes an incentive program for getting the MPI down. As accent training continues, he has them do dialogues from western films. 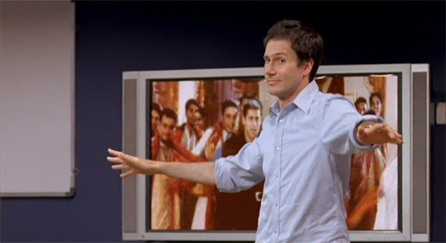 And one night, they make him dance “like Salman Khan!” to “Sajanji Ghar Aaye” from Kuch Kuch Hota Hai. One particularly bright woman named Asha (Ayesha Dharker) has obvious leadership qualities, and he promotes her to second-in-command behind Puro. He’s also increasingly attracted to her, and she to him. But she’s engaged to be married, arranged by her parents, she tells him matter-of-factly. As the days pass and the MPI drops, Todd must face his oncoming departure, which is further complicated by the arrival of his boss Dave. Can the call center get the MPI down to 6.0? Will Todd go home a changed man? Will Todd go home? Why has Dave shown up? You’ll have to watch to find out. Josh Hamilton is perfectly suited for his role: he plays Todd as a not-quite-corporate guy, a kind of everyman—which helps him connect to people and eventually thrive in his new environment. I would love to hear what an Indian thinks about the movie; to me, it’s a realistic and natural (albeit condensed into ninety minutes) look at the differences between cultures. The Indian characters and situations ring true, as does Todd’s period of adjustment. It truly is a little gem of a film; certainly it deserves a wider audience than it seems to have gotten thus far. I loved it! Posted on October 12, 2008 at 2:16 pm in Everything else	| RSS feed You can skip to the end and leave a reply. I recently discovered your blog and your photo-narration is a wonderful way of writing review. I too loved this film though presidential suite scene was completely unexpected and I felt not in line with her characterization where she was so averse to sharing a room one moment and in next…. Vacations in Goa! Nice! that sounds like a funny film. I’d love to watch it. Didn’t even know it existed until now when I read this review. I have read good reviews of this film from others too. I wish I can get a copy of this DVD here ie Down Under. I wud definitely like to see it! I’ve never seen a DVD around of this film. But will check again. Sounds good. theBollywoodFan: Why, yes, there is!!! It’s very cute too. Airports everywhere make me suffer. 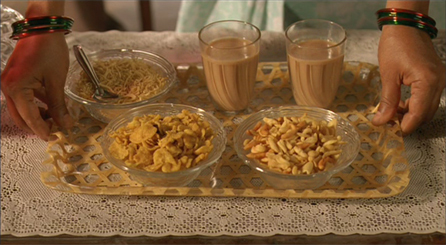 And trays with tea and snacks like Auntyji’s make the suffering worth it. Kanan: Excellent post! And I agree with one commenter that the Delhi airport is MUCH worse than Bombay’s. The Delhi airport is almost impossible to extract yourself from, coming and going. I don’t even really mind the Bombay airport, but the luggage stalkers and cab driver stalkers are overwhelming when you are tired and just want to get to your home/hotel/whatever. I would love to play Holi too. 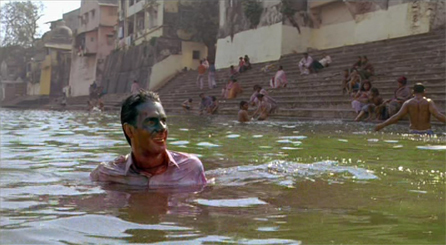 The only Holi scene I’ve seen is the one (well, I guess two) in Sholay and they looked like soooo much fun! This movie looks like fun too. I followed your blog over from Shobhaa de’s and have been absolutely fascinated by your photos especially those of textiles and saris. You have some to die for!!!! I collect textiles and the bulk of my collection comes to me directly from my Mother in Law who was quite the intreprid traveller and culture afficianado in South Asia in the 50’s and 60’s. She saw, she shopped and she collected! As a consequence I have boxes of antique saris and shahtoosh shawls that I am still learning to care for. Fortunately the antiquities act wasnt quite enforced when these treasures left the shores of South Asia, so I get to enjoy them now. But no crown jewels like your beautiful Gara Sari! That will remain unmatched I am sure. Great blog and I will definate make this a prominent stop on my bloghopping adventures. I’ve been avoiding this movie coz I (quite foolishly) assumed this would be crap but now I’m charmed. Off to order I go! Oh, this looks lovely! Looking forward to seeing it. 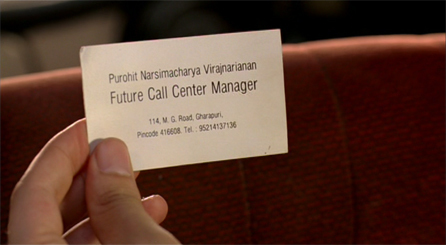 I caught ‘Outsourced’ on a flight just a couple of days ago, and really enjoyed it. I thought that, given the subject matter, the filmmakers managed their ambitions well, and as you’ve said, made a funny (sometimes laugh-out-loud-funny), charming, affectionate (but not patronising) film. 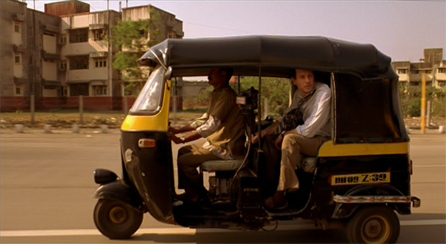 Like you, I got a little ‘homesick’ for India watching it, and was actually a little sad when it was over. Thanks for your review on this film. I just watched it over the weekend based on your recommendation and really enjoyed it too. It also reminded me of my experiences in India and elsewhere where cultures are so different from the west. I smiled often during the film and even laughed out loud a few times! I agree with Ashish that the “Vacations in Goa” tangent was more American in approach than Indian, but no movie is ever perfect. And besides, the soundtrack was excellent — might have to purchase the CD! I’m glad you liked it, Sally :) I’ve seen it two and a half times now, and still like it too. I am a Netflix customer and have had “Outsourced” as one of my three movies for more than a month. It’s such a feel-good, happy movie I cannot bring myself to send it back! I grew up the son of a U.S. diplomat and spent time in India, so it has the ring of familiarity to me. It’s also nice to see a movie that seems almost real. Imagine wanting “those cheesy things!” No stereotypical behavior or “super” American hero. Mr. Toad is a frail, insecure visitor when he arrives. He learns about India and as a result, becomes a wonderful boss. What a find! You should probably just own it :-) I do, and I have watched it quite a few times and it still never fails to amuse me. The airport placard with “Mr. Toad” written on it, and the sheer chaos of arriving there—hahahahaa! I laugh just thinking about it. Reluctantly got off my sofa as the titles appeared (in the end ;-) ). It was a great movie and should have been lengthier. Characterization was excellent. I give it a 9 out of 10. Agreed, it’s a lovely little film. Thanks for the nice visual review which recalled many of the film’s crucial moments. I can ignore all the clichés almost scholarly spread out here. 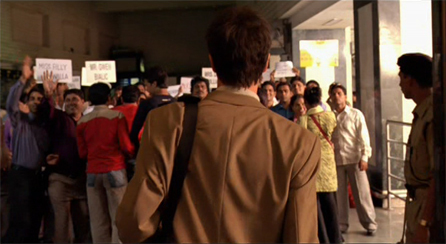 And yes, i too could go down well with that airport arrival at the movie’s beginning: bewilderment… i had it, arriving alone in Mumbai and half a dozen or so other south Asian countries. Even though you’d wonder: don’t they read the relevant “Culture Shock” book before heading out? It’s a good series for the uninitiated and even strictly from a professional view, one should read something like that before heading out. Would that film appeal to viewers who are just looking for a good time, without a special Indian, or let’s say, hot country faible? Then Outsourced had the touch i don’t like so much about western movies: a story of attraction, maybe even, sorry, love – but a rather ambiguous ending. Give me the eastern happy-ever-after anytime. Not sure. I think issues like left-hand use, street food, no shoes and showing affection in public are well covered even in the shortest guide book or travel article. One should assume that the business traveler reads that at least on the inbound plane. And actually, i found these issues in S-Asian reality less strict handled than in the movie. 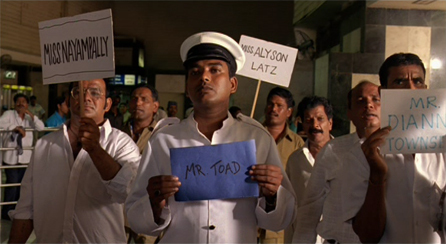 The taxi drivers, holding placards that misspell the names of their passengers is hilarious (and real). Mr Toad, Auntyji,Cow, Holi– it cannot get any more funny than that. You mean to say that you too were subjected to the mae questions in India. “What is your salary ?” “Are you married ?” etc. Desi auntijis are indeed nosey creatures. Nosey and often very rude too (making comments about weight, hair color, etc. :) But I don’t mind it! Maybe if they were MY aunties it would get tiresome but for a short time it just makes me laugh. This is a very funny film indeed Atul…you should see it (but no songs, sadly). It’s a surprise for me and I like this movie a lot. I found this movie after watching The Terrorist which starred Ayesha Dhakar. I wanted to know what other movie she’s in. I found this and Star Wars which I will have to watch again. At first I thought it’s not gonna be funny and my finger was on the stop button and move on to the next movie. 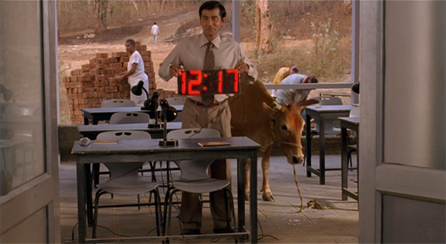 But I totally got hooked the moment Mr. Doad got to India. Good movie, now I have more appreciation for people on the other end when I call for technical support or order stuffs from a catalog. Rams, Ayesha is also in Loins of Punjab and Anita and Me. Anita and Me is a movie about NRIs in a poor part of England. It’s not depressing, it’s amazing. I loved loved loved this movie – cute and charming and cho chweet fit perfectly. Is she in Loins of Punjab Presents? I just got that recently, need to watch it :) I have not heard of Anita and Me but it sounds lovely too. This is one of the best Call Center movies around. I left IBM-Daksh about 3 years ago and watched this movie like a teenager lass, crying my way through a tragic rom-com! if you liked this movie…download and watch “mumbai calling” starring sanjeev bhaskar…it is infinitely more funny and as a bonus, 98% of the dialogues are in english…it is a teleseries with basically the same plot…London resident sanjeev bhaskar comes home to mumbai as call center head and the events that follow are hilarious…sparkling sense of humour & crisp dialogues…also the indian stereotypes are not so glaringly over the top as in this movie !! !